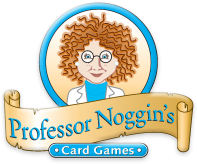 The first Professor Noggin's card game was invented by Dave Manga in 2002. This popular series now numbers 38 games, which have won many major awards, receiving honors from the likes of the Parent's Choice Foundation, the National Association for Gifted Children and Scholastic Instructor Magazine. Professor Noggin's card games are themed with 180 questions based on one subject such as Presidents of the United States, Geography of Canada, Pets, Wildlife of North America and many more. The game play is the same for each title and it's easy to play the game right out of the box, which makes collecting different titles simple and fun. With two levels of difficulty, younger children can still play with older siblings or adults and have a lot of fun. The Noggin's Choice card can help even the score too as players can use this element to take a card from another player.